The Environmental Protection Agency claims that indoor pollutants can be five times more toxic than the outside. In some buildings, the air pollution can be 100 times more polluted. The World Health Organization has stated numerous times that 85% of all cancers are attributed to environmental rather than genetic factors. This suggests that cancer is caused by exposure to carcinogens found in household cleaners, dust, building materials, and smoke. It is highly recommended to invest in a high-quality air filter for all indoor spaces, especially rooms and cars. Here’s some information about indoor pollution and the best air purifiers allergies can be treated with. Inside air can be a serious health risk if it is not clean and pure. Since the average person with a home spends around 90% of their time inside, it is important to invest in our air to maximize the health of our bodies. 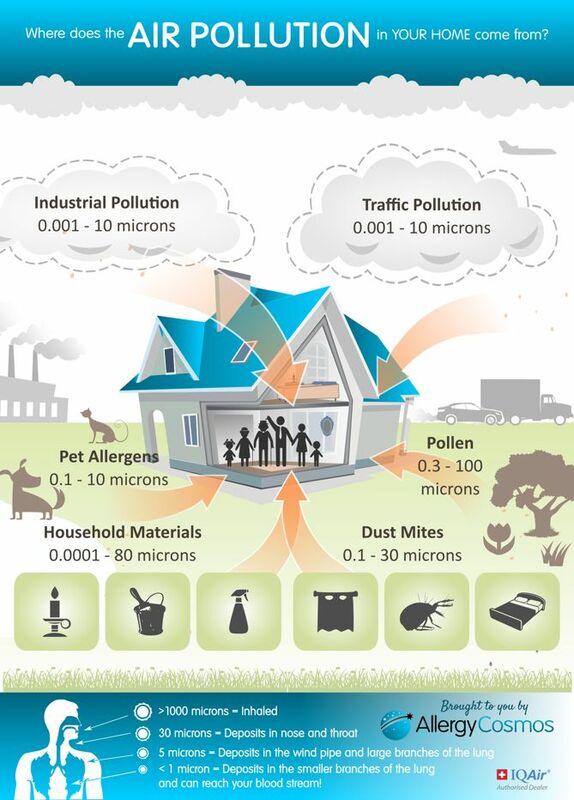 One serious thing to consider is the amount of possible sources of pollution lowering our home’s air quality. The term “indoor air pollution” is an umbrella term that encompasses dozens of sources of toxic airborne material that can negatively affect the human body. Cracks in the walls or floor of your home can allow radioactive radon to seep into the environment of your home. Radon is the second-leading cause of lung cancer and it can seriously affect your health in other areas as well. 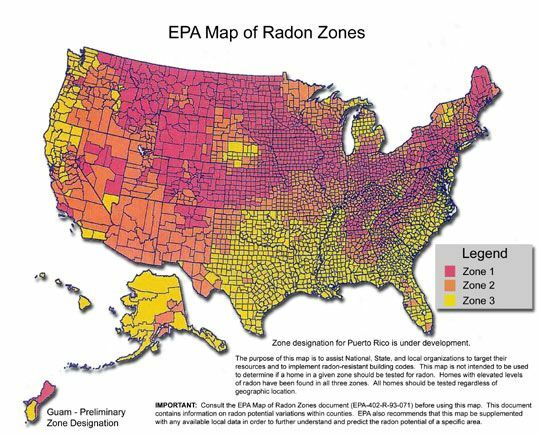 Radon is odorless and colorless, making it hard to distinguish its presence. It can be anywhere—inside any home and you won’t even know it. It is a gas that is inhaled into the lungs, where it damages cell DNA, which is what creates the potential for cancer. Radon is usually carried by water and can float down and collect in your basement if you frequently experience flooding. It is important to have adequate ventilation in your home because radon can be airborne in solid form, which can cling to dust and cause serious lung damage. People will never be the only ones living in our homes. From pets, to mold, viruses, bacteria—all the living things around you can make their contributions to the environmental air in your home. They can create a range of health problems. A quality air purifier will help you get rid of the toxic byproducts that these living things create. Mold is a term that encompasses many types of fungi. There are thousands of species of mold that grow indoors and outdoors .You may notice the presence of mold from a few unpleasant connotations: musty odor, damp floors, moldy carpets, soggy drywall, athlete’s foot, etc. Symptoms of mold exposure include allergic reactions, asthma attacks, irritates eyes, skin, nose and throat, as well as lung problems. You can get your home tested for mold if you suspect a serious overgrowth. You can read more about toxic mold here. Millions of people that have a dog or cat are allergic to their pet’s dander and don’t even know it. It also has no correlation to the length of the fur that the pet has. Their skin sheds and creates dander, which floats around in the air to be easily inhaled. Dander is extremely light—a smaller form of dandruff like humans have. Dander can cause allergic reactions if it comes in contact with the skin or lungs, so ventilation and air purification will greatly assist in the removal of this irritant from the air. I wrote a bit more on how you can be allergic to your pet and not realize it here. Water and stain repellent on clothes and upholstery. Government agencies often try to regulate the amount of formaldehyde used in building furniture and other products, but the sheer number of formaldehyde releasing products in our homes already are simply too great to be avoided for a long time. The health effects for each person will be different and some people are sensitive to formaldehyde and react more allergically than others. Formaldehyde does not have a distinct odor or color that indicates its presense and that is why it is dangerous. The International Agency for Research on Cancer (IARC) has declared that formaldehyde is “carcinogenic to humans,” meaning that there is much research to prove that this substance causes cancer. An air purifier will dramatically reduce the amount of formaldehyde in your entire home. Cleansers can poison the air if it is not properly ventilated. Inside use of pesticides, bleach, paints and air fresheners (candles and incense as well) can release toxins in the air of your home. Bleach and cleansers contain ethers, which bind with ozone to form an invisible poisonous cloud. Frequent use of candles and air fresheners release VOC’s like nitrogen dioxide. Plastics and cosmetics can contain phthalates, which interfere with the endocrine system. Fire prevention chemicals contain PBDE’s that can bioaccumulate in the body and cause brain damage, learning disabilities, and memory less. They are found in plastics, electronics, and mattresses. Perfluorinated acids(PFA’s) can cause birth defects and damage the thyroid and liver. They can be found on non-stick cookware. Chlorine in bathroom cleaners and paint thinners are toxic in nature and cause circulatory system damage. Hypochlorites in bleach and disinfectants are corrosive and can seriously irritate the skin and eyes. They also cause nervous, respiratory and digestive system damage. If you like to freshen your home, you should try some non-toxic natural air fresheners that smell even better. You can try getting an essential oil diffuser and make your own blends of nature oils to set the perfect desired mood. Essential oils are incredibly relaxing and have a ton of health benefits. Even if you keep the windows down, cars are basically toxic gas factories that are always seeping poisons inside of your car slowly. The majority of the inside of cars have extremely unhealthy environments that can affect your health even if you drive for only 30 minutes each day. We spent so much time in our cars if you think about it. I’ve always thought about why I’ve never seen an air purifier in somebody’s car. What about in the winter when you don’t ever roll down your windows? This time of the year is when cars get extremely dusty and dirty. You may find that you have a depressed mood or slightly off feeling right after getting out of your car and especially if you’ve been in it for too long. I have recently found a very inexpensive car air purifier for your car. It plugs into the jack in your car, has two charging spots and purifies and filters the air in your car silently. It’s under $6 and is a great long-term investment for your health. You can get it with free shipping here. Health professionals insist upon opening the windows in your car. It is a very tight space that gets contaminated with gasoline fumes, smoke, engine products, and other things you can be allergic to, like pollen. But sometimes it’s too cold to open the windows and even the air blowing may not be enough. A great all-around air purifier for a great price. This device will remove many harmful contaminants and particles economically. Click the image for a discount! You should try to open the windows in your home and incorporate indoor houseplants into your living environments. However, that may not be enough to purify particles, pollen, or chemicals. A great air purifier that noticeably does the job for me is this one. It really does a lot of work to its surroundings. When I turn it on, the fresh air it creates reminds me of being at the fresh, clean shore. It’s highly recommended if you find yourself frequently sneezing from seasonal allergies or if you think your home is poorly ventilated with many possible contaminants. I was really surprised at how good of a price this quality air purifier was. I am always here for you, so if you have a question or something to add about the best air purifiers allergies can be treated with, please leave me a comment!